Torch: A reducing glass that can develop a metallic sheen similar to polished hematite. Begin by working 001714-0576 in a neutral flame. 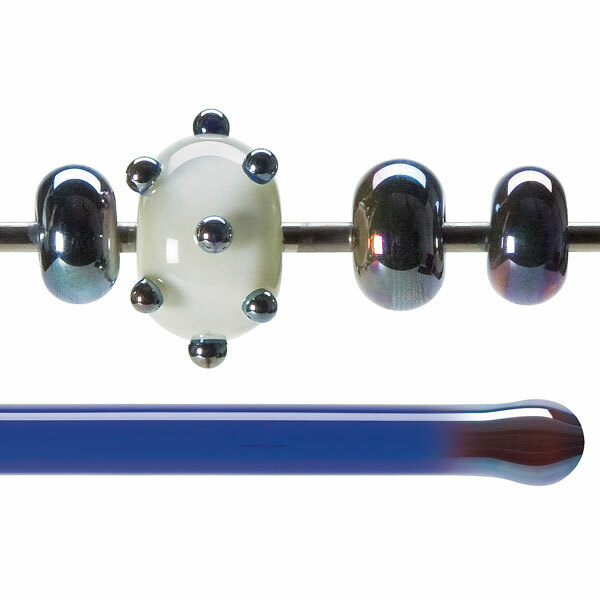 When ready to develop a metallic sheen, the glass should be relatively cool (no visible heat) and stable on the mandrel. Create a reduction atmosphere by turning the propane (fuel) up and watch for the surface of the glass to become metallic. Once this has happened, the piece should be put into an annealing kiln. This is a finishing step. If the metallic surface is reintroduced to a neutral flame, it will dissipate. It can be brought out again by returning it to a reduction atmosphere. When molten, this glass has a low viscosity, and can be quite soft, which may result in a blurred edge where it meets other glasses. In addition, the process of reducing the glass can cause a metallic sheen over areas of glass immediately adjacent to this style. 001714-0576 is a relatively heavy glass, and there are 14 rods per pound (compared with 18-20 rods per pound for most other styles). Labeling is encouraged, because 001714-0576 stays deceptively blue until reduced.